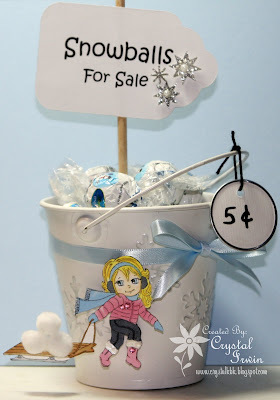 Crystal's Crafty Creations: Snowballs for Sale! Good Morning Everyone Happy Wednesday!!!! I wasn't around much yesterday in blog land so hopefully I will get a chance today to stop by and visit everyone...More and more Holiday shopping.....and housework....!!! I don't think housework ever goes away!!! My husband is having knee surgery today so I will be sitting with him at the hospital.......Please say a little prayer for him if you get a minute. He is having knee surgery.....he has had knee problems for years....but since he has had this issue for so long...why oh why does he schedule his surgery on our wedding Anniversary....????? I can't figure this one out, am I not paying enough attention to him on our Anniversary....LOL!!!! Thought maybe some of you could tell me some funny things or interesting stories about your husband that you just don't get!!!!! HEHEH that sounds like fun, I need a giggle today!!! Well getting on to my project today......Inky Impression's challenge this week is to add snowflakes..!!! I had this cute little pail with snowflakes all over it that I found at target for a dollar.....I just love these tins they make such a great quick gift.....!!! I saw this really cute design with snowballs in one of my many magazines. I wanted to use this sweet idea and add my style and personal touch to this fun project....I used the adorable image Angelica's sled....I just LOVE this sweet image!!! Hope you like my project today and if you get a chance come on over and check out our challenge HERE. We would LOVE to have you play along!!! Hope everyone enjoys their day and thanks so much for stopping by. Image - Angelica's Sled by Inky Impressions stamped in Momento Ink twice, cut out, popped up and colored with copics. I added some cute little cotton balls to her sled for snowballs. Accessories - Holiday Tin from Target, Holiday Candies, Sizzix die cut tag, Snowballs for sale typed on computer and printed out, Skewer, Misc Ribbon, White Tag and wrote with a black zig 5 cents, Pop Dots, Misc. Silver Snowflake Stickers. Cute project! Hope your hubby feels better soon. OMG Crystal - this is fantastic! I love it! What a great idea - I've got to check out our $$$ store! Good luck with DH's surgery! Men are such funny little creatures - you are certain to hear some very cute stories today! I'll be thinking about you - big hugs! Let us hear from you when it's over! Oh what fun, I love your this project, FABULOUS. Oh what a great project Crystal!! I just love your pail!!! Too sweet!! I will have to pick up some of these!! Angelica's sled is colored so beautifully. Love the snowballs. Is that Lindt chocolate? You can send them my way. TEE Hee!! I hope your hubby feels better soon!! Awesome...love the snowballs on the sled...too smart! And I'll take what's on the inside too! This is beautiful!! Hope your hubby feels better! Well I really like your bucket, its such a great idea. Hope all goes well for your Hubby, and Happy Anniversary, sorry no funny stories from me. But lots of love and best wishes. I think I have to case this project right away....I wondered what I was going to do with those cute buckets!!! Hope everything goes well for hubby, and don't even THINK about housework!!! Great project! It is so cute and what a different kind of candy bowl, definately not like my grandmothers. Hope the surgery goes well! How cute Crystal! love this fun snowpail and the snowballs on the sled! praying for hubby. aren't they all alike. does he KNOW it's your anniversary????? my hubby is a diabetic - does not take care of himself and wonders why the doc says he needs to take better care of himself. he (hubby) does the same with the car.... sure it's making noise, but as long as it's still running, don't fix it. men!!!! grrrrrrrr! HAPPY ANNIVERSARY my friend!! I will keep both you & hubby in my prayers today! For him to come through the surgery with flying colors and for you not to worry too much! I certainly know what it's like to sit at the hospital while you're beloved is going through a procedure! But I also know that the good Lord will watch over you both! Hang in there Crystal ... if you need ANYTHING ... you know where I am ... don't hesitate to ask ... REALLY!!! Oh yea, your project is adorable .. you are so good with these little giftie ideas!! HUGS!! It took all of my will-power not to buy those cute snowflake tins!! This is an adorable project! Great project Crystal , i love it. Such a cute idea. Oooo good luck for your hubby, sounds yuk. Hmmm my hubby is always away on anniversaries and birthdays but I can't blame him as he is usually sent away with the army. Gorgeous project Crystal! Fantastic coloring! Perfect pail for chocolates! Happy Anniversary...hope your hubby feels better soon! Crystal this is ADORABLE! What a super cute project! Happy Anniversary to you and your Hubby! Oh wow, what a fab idea. awwww Crystal this is way toooo cute!!! I LOVE IT!!! I love all the details on your project! Hope everything goes well for hubby!!!! And hope he feels well soon hun!!! Happy Anniversary tooo hun!!! This is adorable, what a great idea and holiday decor! This is just so creative and adorable!! What a great idea!! I sure hope that your hubby feels better real soon!! Fab project Crystal - Hope your hubby's knee op went okay. Hope the surgery goes well and I will say a prayer for him now! Well, I hope your husband came through surgery ok! What a cute little container of snowballs! Such a fun idea Crystal! Crystal this is so adorably sweet! Love your coloring on this little cutie too! Hope your hubby has a speedy recovery, keep us updated! This is absolutely adorable, Crystal!!! I love that sweet image and the snowballs look fantastic! FYI, I asked my hubby if he would ever schedule knee surgery on our anniversary and he said "I don't see why not". Sheesh, at least you're not alone! Happy Anniversary!!! Just adorable Crystal!!! LOVE this cute idea! I do hope your hubby's surgery goes well! Hugs!!!! Happy Anniversary!! Hope the surgery went well and the recovery is speedy! Totally cute project!! Love it! Hope your husband is doing well following his surgery!! This will certainly be an anniversary that stands out in your memory!! Great work with your precious pail! Happy Anniversary Crystal!!! We spent our 25th anniversary in the emergency room with me having a major allergic reaction to a new medication, so I guess wives can be just as bad. lol I hope all went well with your dh's surgery. I'm praying for both of you as he recovers. Most men don't do very well with being sick or injured. I hope your's like that. Be sure to do something special for your anniversary when dh feels better. That's what we had to do. I love your project!!! It's one of the best ideas I've seen this season. I definitely have to try it. wow Crystal! This is fabulous. Your project are always stunning! I love the snowballs on the sled, great idea. Happy wedding anniversary, hope your husband get better soon. I'm sure he'll make it up to you. What a cute idea.....I make cookies and candies to give away...waht a cute idea to add to the "box" of goodies!! Hope your hubby recovers soon and you don't have to wait on him too much....maybe hand him a clipboard with a stamped image and some watercolor pencils...bet he won't bug yopu after that...heehee...and as for not figuring our why my hubby does some of the silly things he does, well there isn't enough room here...Thanksgiving weekend was a perfect example of "what was he thinking"!! What a cute idea for a gift. I hope your DH feels much better for Christmas and happy anniversary. Awesome way to use these fun Target tins and I love the little cotton snowballs on the sled! I have to ask you something: who is the winner of your candy? OMG Crystal this is so cute! I'm going to have to work this up as my candy dish on my desk! LOVE IT! What a fabulous project!! This is absolutely wonderful! also love the theme/design), I don't have time to read it all at the minute but I have book-marked it and also included your RSS feeds, so when I have time I will be back to read a lot more, Please do keep up the fantastic work.